Onion is an age old remedy for different diseases. For years, it has been used in a variety of ways to fight germs, bacteria and infections. In fact, it has a special place in both Ayurveda as well as Chinese traditional medicine. To understand the importance of onion in traditional medicine, it is essential to know about onion in details. Onion contains phosphoric acid which aids in purifying the blood and fighting infections. It is the phosphoric acid content that makes you cry when you cut onions open. Also, being a natural anti-inflammatory, onion helps in reducing inflammation and pain. However, it is not always necessary to consume onions in order to reap its benefits. You can apply onion to your skin topically, also known as trans-dermal application, to enjoy its benefits. The amazing internal effect of onion when it comes into contact with the body without ingesting it, has compelled people to use onion in many ways. 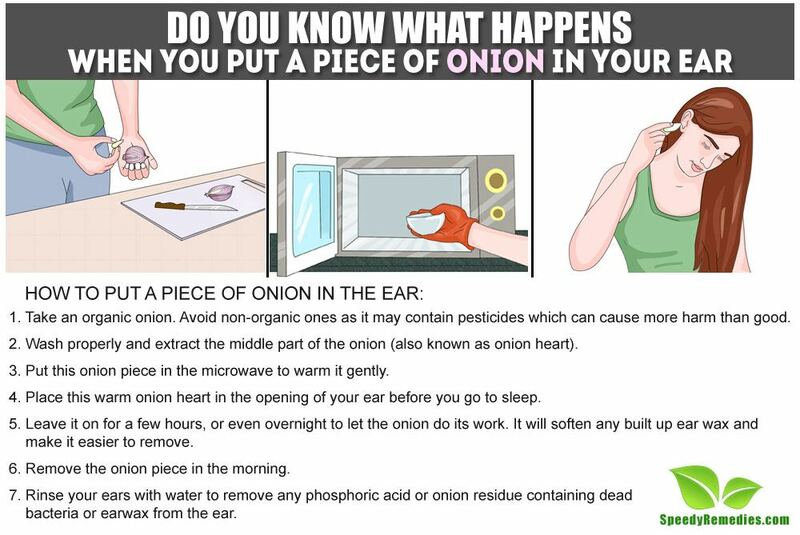 In fact, there is a tradition of putting a piece of onion in the ear and it has many benefits. When it comes to ear infection, you can give this onion remedy a try. The warm nature of the onion as well as its vapor helps to fight the ear infection. It keeps your ears healthy and reduces inflammation. The phosphoric acid can help in softening the ear wax, thus making it easier to remove. It is also effective in dealing with ringing in your ear (known as tinnitus). Plus, the flavonoid quercetin, which is highly concentrated in this bulbous vegetable, has certain anti-inflammatory properties that can aid in reducing ear pain. Take an organic onion. Avoid non-organic ones as it may contain pesticides which can cause more harm than good. Wash properly and extract the middle part of the onion (also known as onion heart). Put this onion piece in the microwave to warm it gently. Place this warm onion heart in the opening of your ear before you go to sleep. Leave it on for a few hours, or even overnight to let the onion do its work. It will soften any built up ear wax and make it easier to remove. Remove the onion piece in the morning. Rinse your ears with water to remove any phosphoric acid or onion residue containing dead bacteria or earwax from the ear. This age old self-healing trick also helps in effectively decreasing any inflammation in the ear that is causing you pain. Also, this trick is cheap, all natural, and can be done in the comfort of your own home. However, there are certain drawbacks to this interesting trick. The pungent smell of onion is not very pleasant and usually not liked by everyone. Tip: Besides using onion for your ear, you can also try placing a piece of onion in your socks before wearing it and leave it for 7 to 8 hours. It is a simple trick that can allegedly remove toxins from the body and can help fight colds, fevers, and flu-like symptoms.